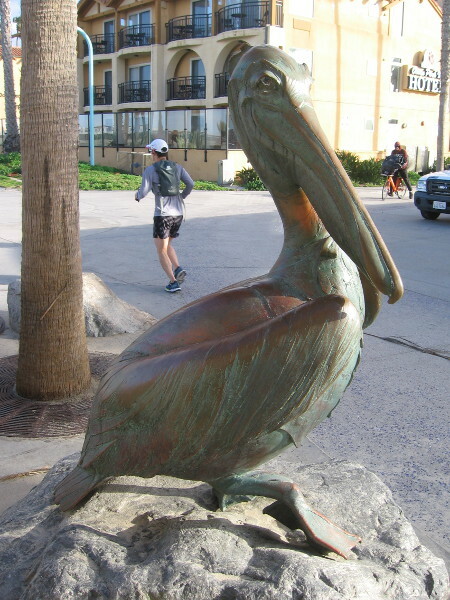 bronze – Cool San Diego Sights! 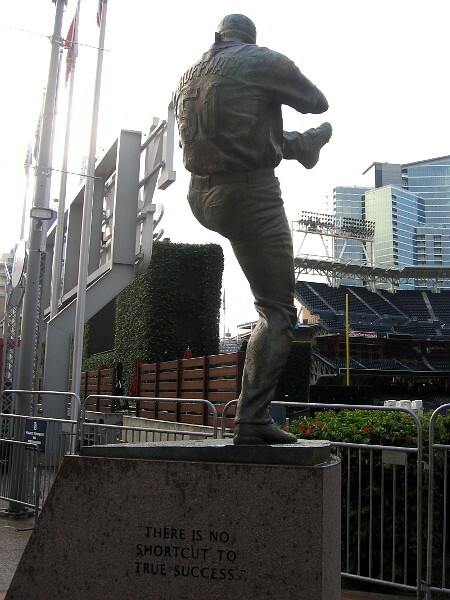 Statue of Hall of Fame relief pitcher Trevor Hoffman at Petco Park, home of the San Diego Padres. 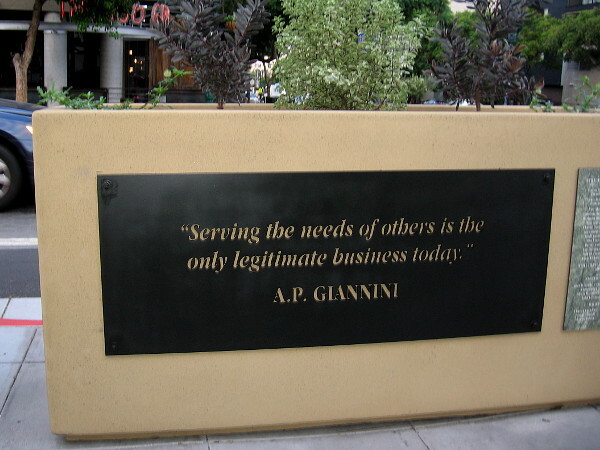 “There is no shortcut to true success.” Those are the words of Trevor Hoffman, 2018 inductee into the National Baseball Hall of Fame. 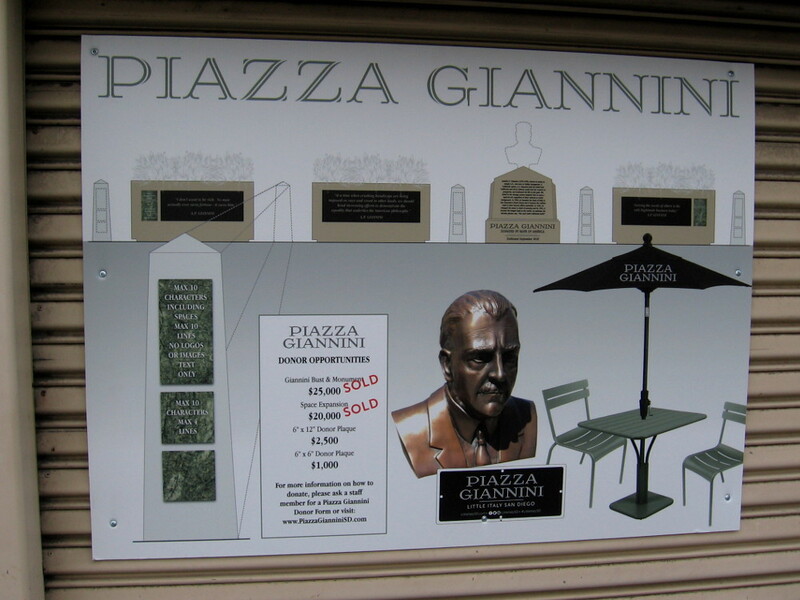 He is remembered as one of the greatest players in the history of baseball. 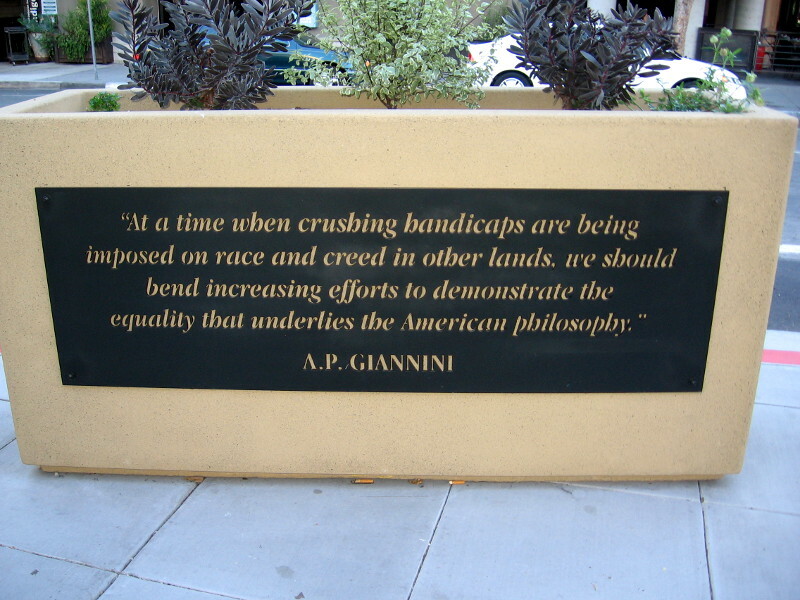 The wise quote adorns the base of his bronze statue, which was unveiled this summer at Petco Park. 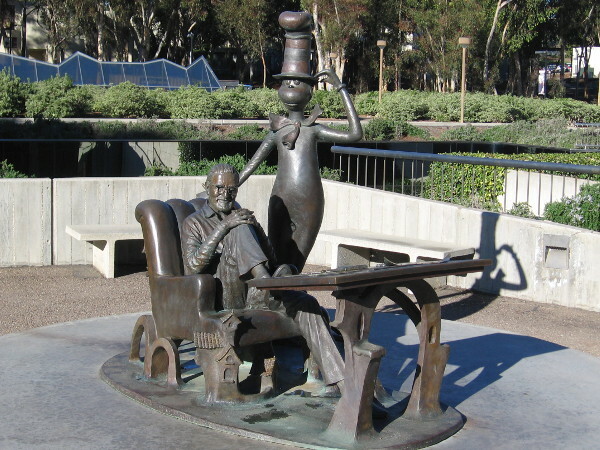 Great achievements require hard work and persistence. 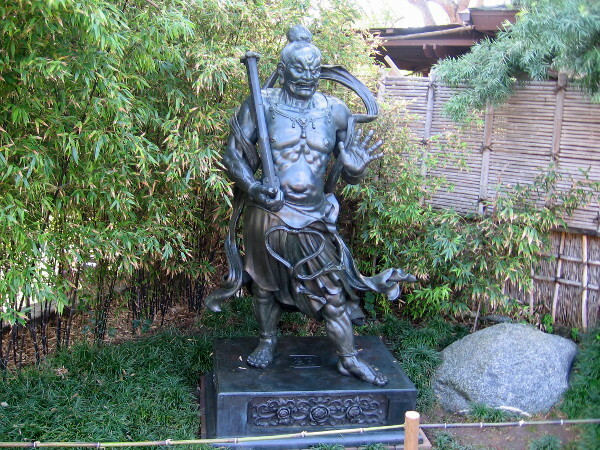 Achievements that endure the test of time must be built game by game, inning by inning, pitch by pitch. 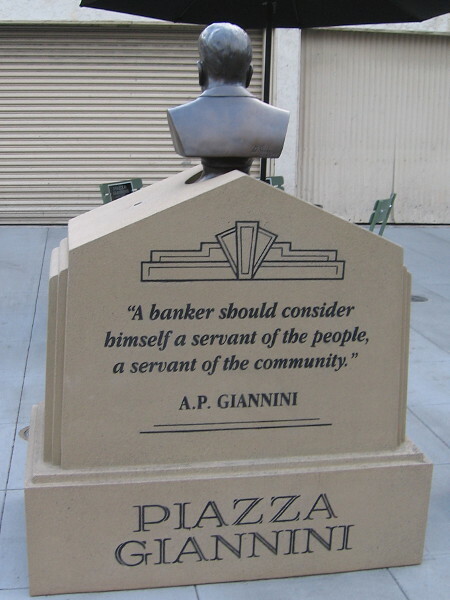 The San Diego Padres have honored two of their Hall of Fame players with magnificent statues at Petco Park. 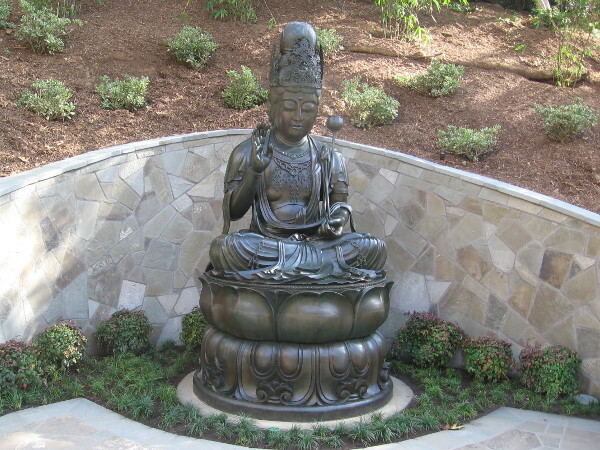 Both Tony Gwynn and Trevor Hoffman are now immortalized in bronze. 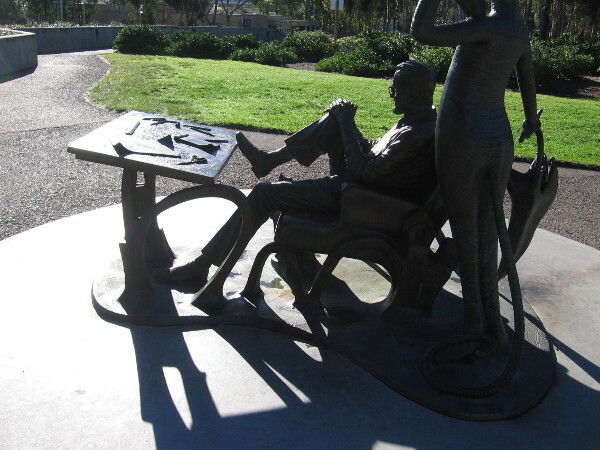 Both sculptures were created by artist William Behrends, who has been referred to as the Sculptor of Sporting History. 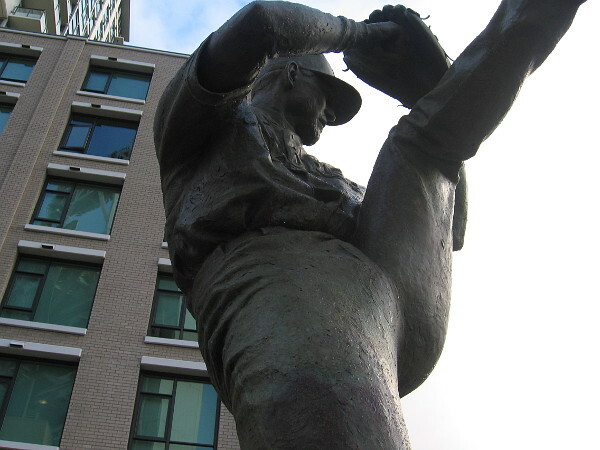 I posted a few photos of the Tony Gwynn statue five years ago here. 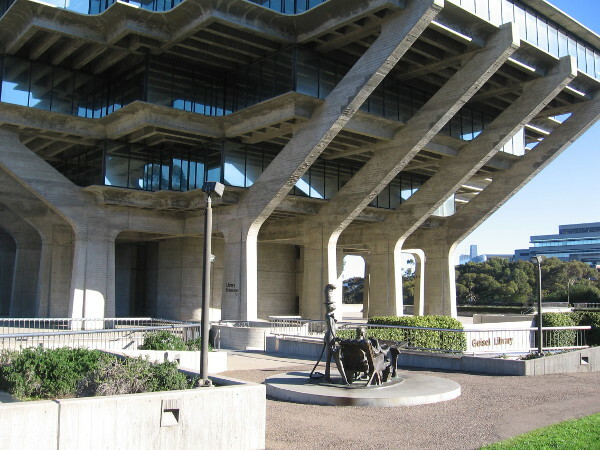 Neither Trevor Hoffman nor Tony Gwynn chose the easy path. 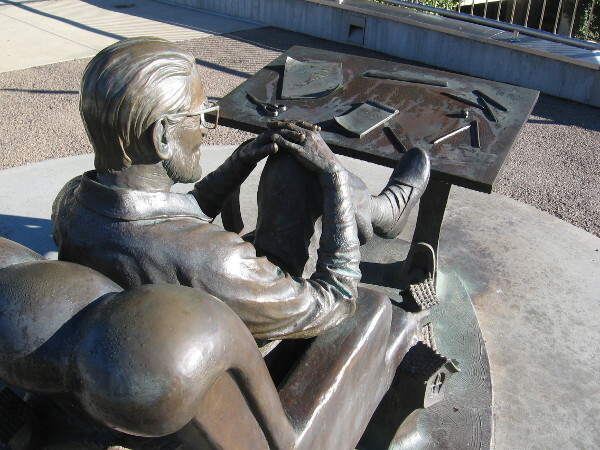 Both worked constantly, studied the game, and never stopped honing their skills. 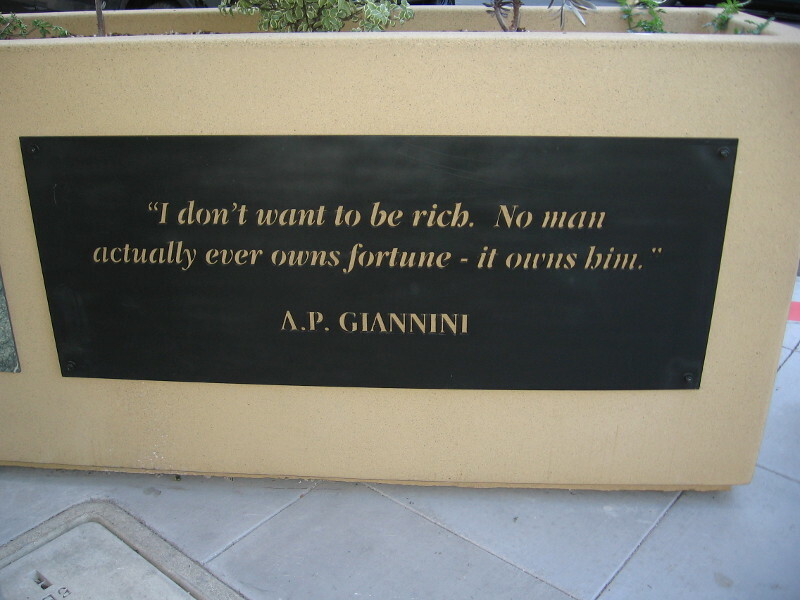 “There is no shortcut to true success.” To those who have high aspirations, important words to remember. 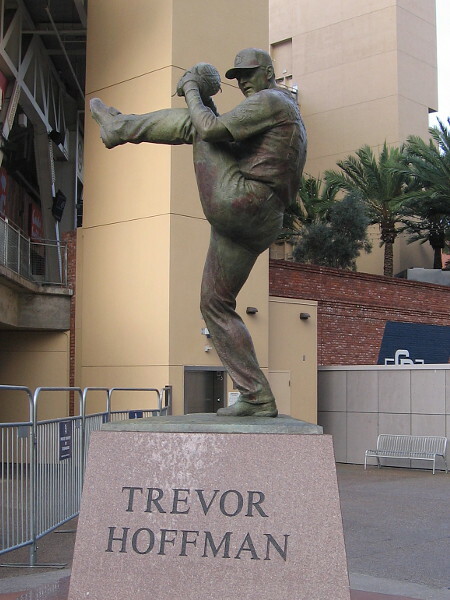 A sculpture of Trevor Hoffman overlooks the Padres bullpen, just beyond left field at Petco Park. 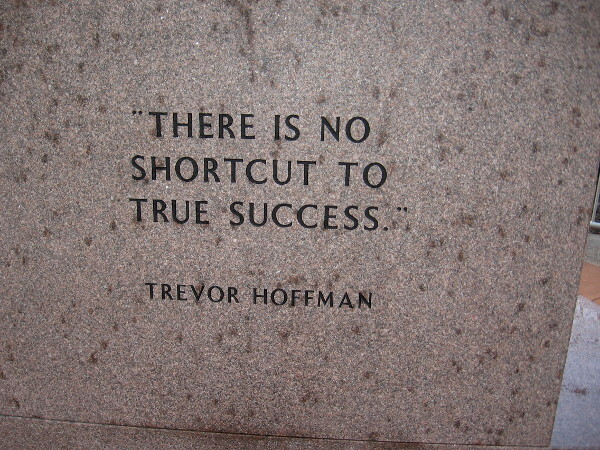 There is no shortcut to true success. 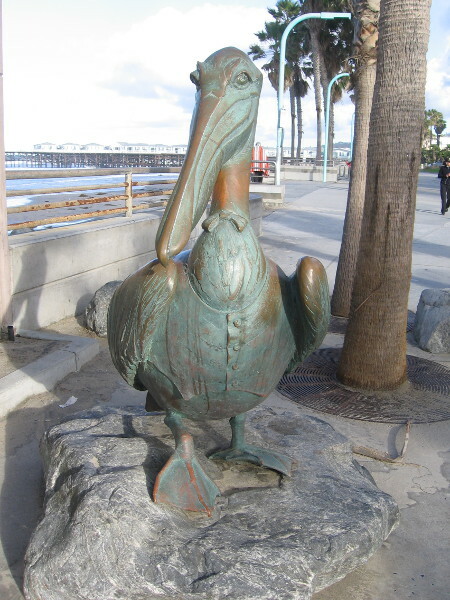 Trevor Hoffman. 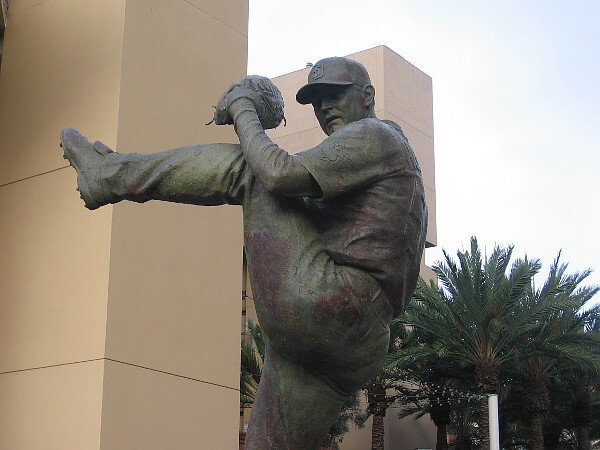 The high leg kick of Hall of Fame relief pitcher Trevor Hoffman immortalized in bronze. 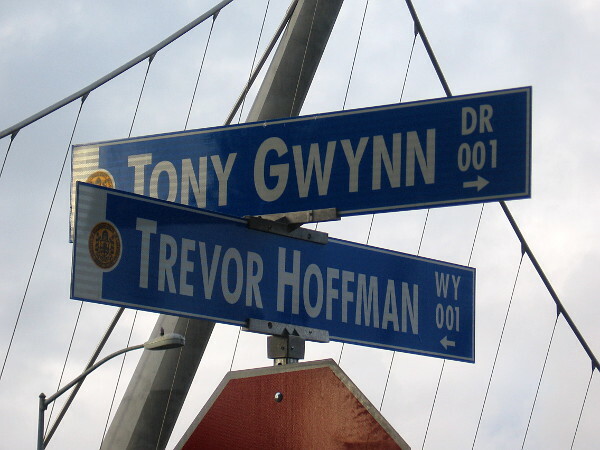 Two legends of baseball now intersect at Tony Gwynn Drive and Trevor Hoffman Way, just outside Petco Park. 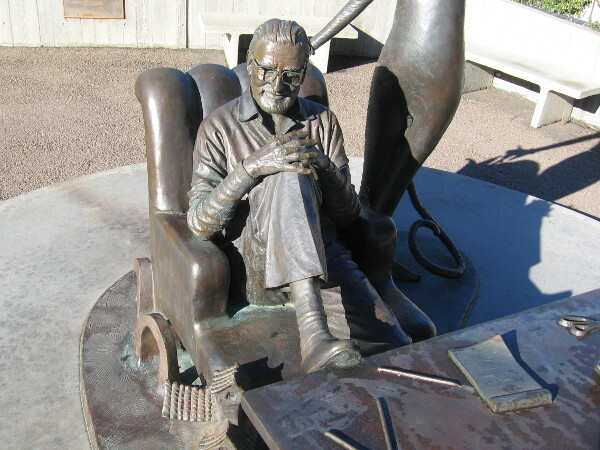 The bronze sculpture of legendary pitcher Trevor Hoffman, by artist William Behrends. 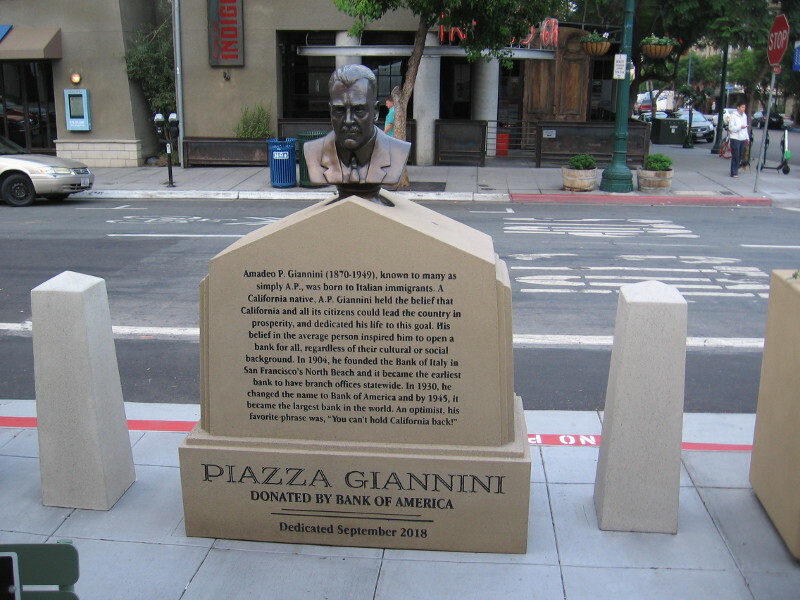 Tuna fishermen remembered at Piazza Pescatore. 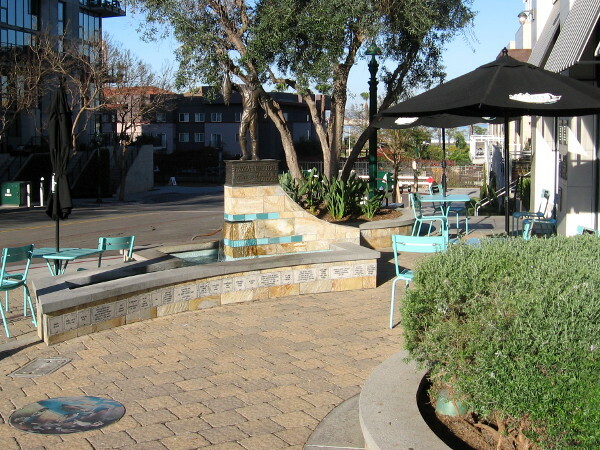 Piazza Pescatore is a beautiful place where neighbors can relax and mingle at the corner of Kettner Boulevard and Fir Street. 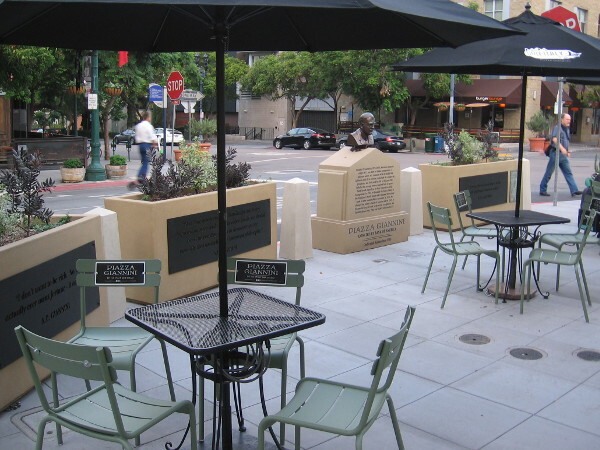 In Little Italy, at the corner of and Kettner Boulevard and Fir Street, you’ll find Piazza Pescatore. 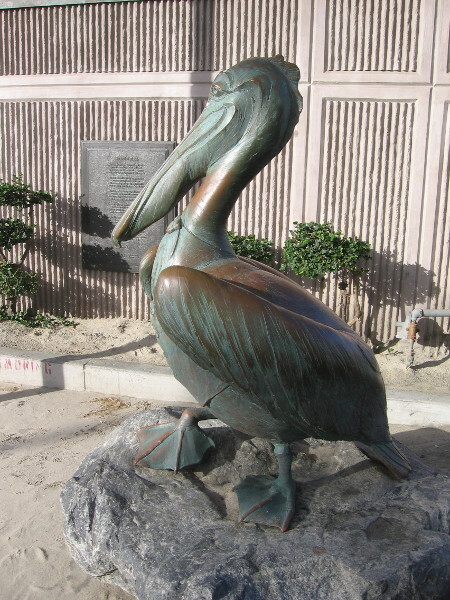 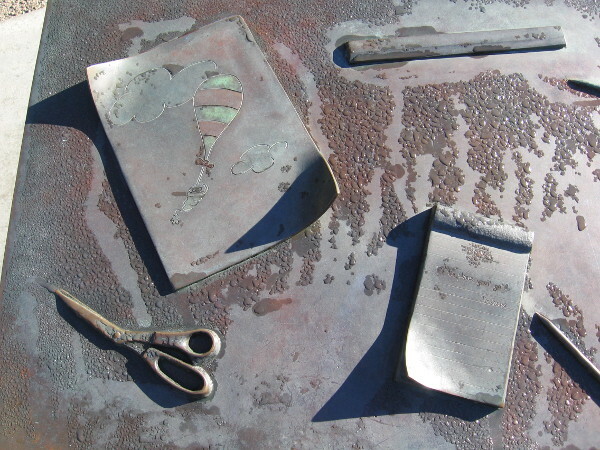 The small community gathering place features a bronze sculpture and beautiful fountain, and plaques that remember the history of the many hard-working tuna fishermen that inhabited this San Diego neighborhood decades ago. 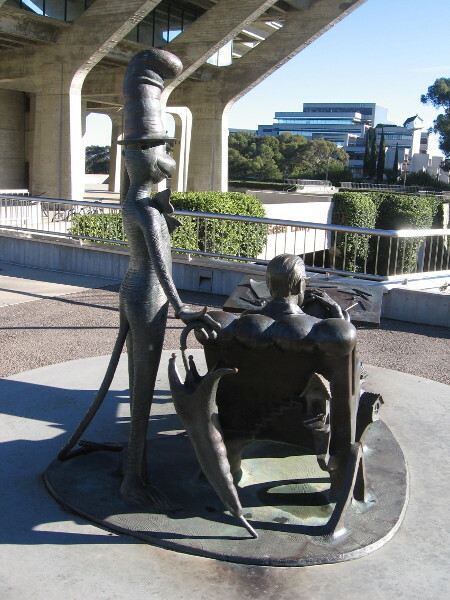 The artists who created this cool public artwork are sculptor Gregory Reade and mosaic artist Kim Emerson. 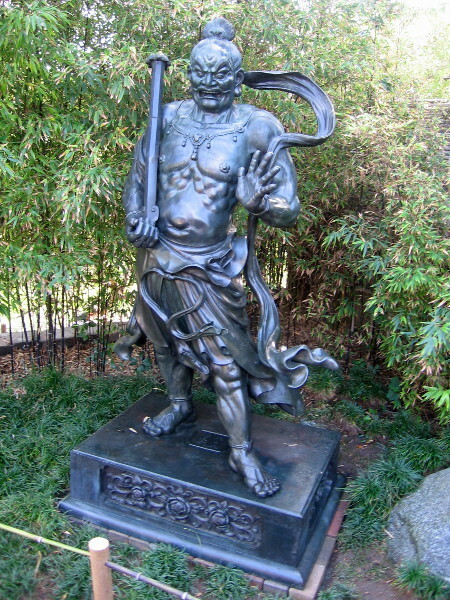 A bronze sculpture of a tuna fishermen holding his catch. 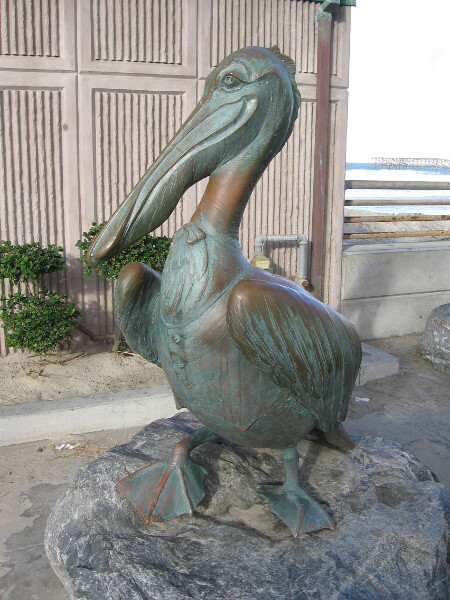 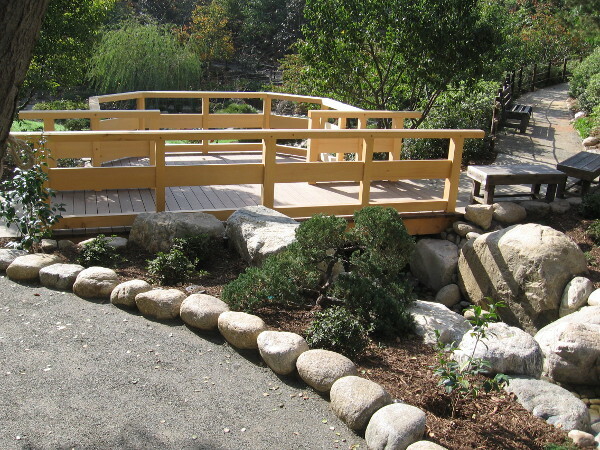 Piazza Pescatore was donated by Bumble Bee Seafoods, which is headquartered in San Diego. 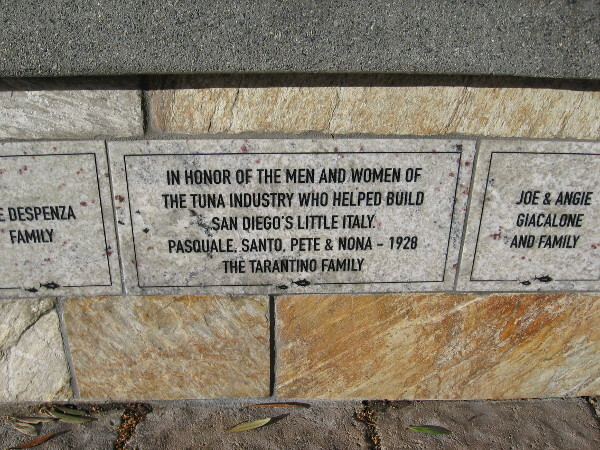 A plaque honors the men and women of the tuna industry who helped build San Diego’s Little Italy. 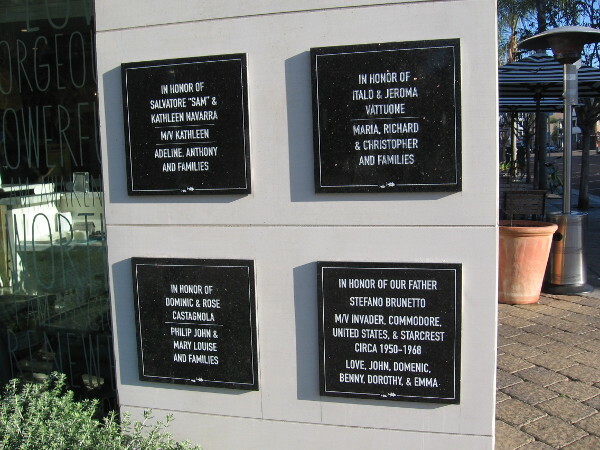 More plaques at Piazza Pescatore honor those who made San Diego the tuna capital of the world during much of the 20th century. 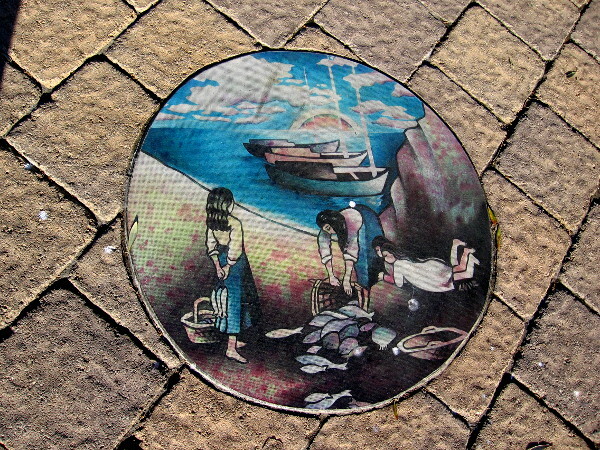 A colorful circle of artwork on the nearby sidewalk shows women with baskets and bountiful fresh fish. 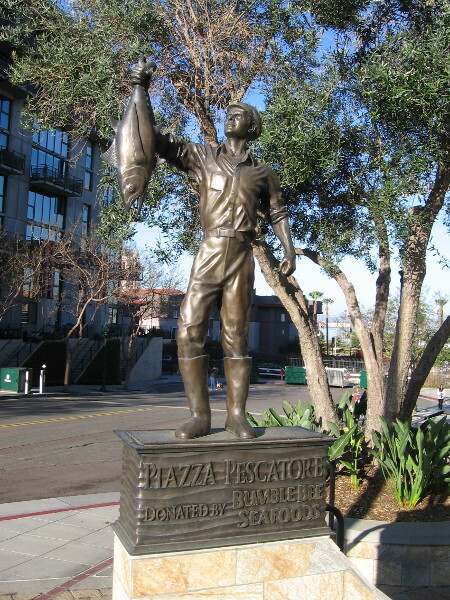 Posted on May 12, 2018 May 12, 2018 Tags art, artists, bronze, color, community, cool, fishing, history, little italy, photo, public art, san diego, sculpture, streetsLeave a comment on Tuna fishermen remembered at Piazza Pescatore. 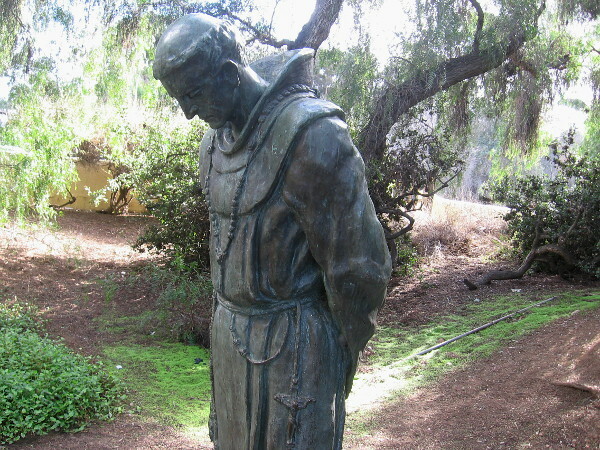 Photos of The Padre sculpture in Presidio Park. 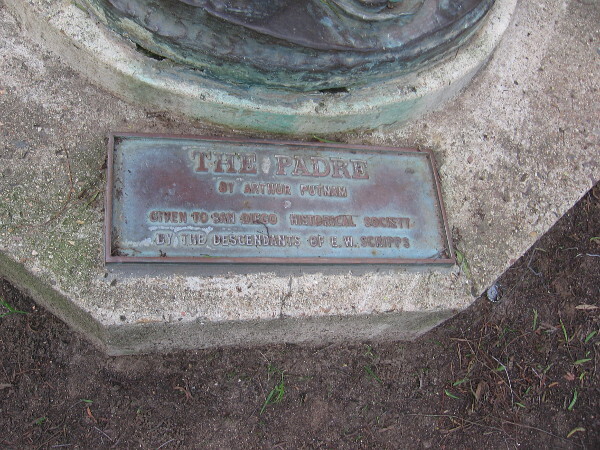 The Padre, by Arthur Putnam, 1908. 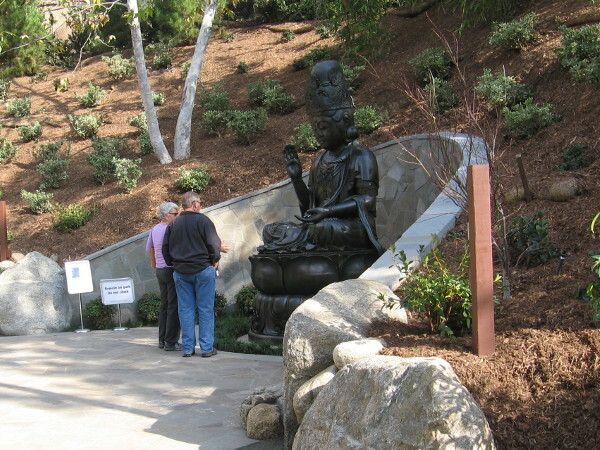 The public artwork stands on a patch of grass among trees on Presidio Hill. 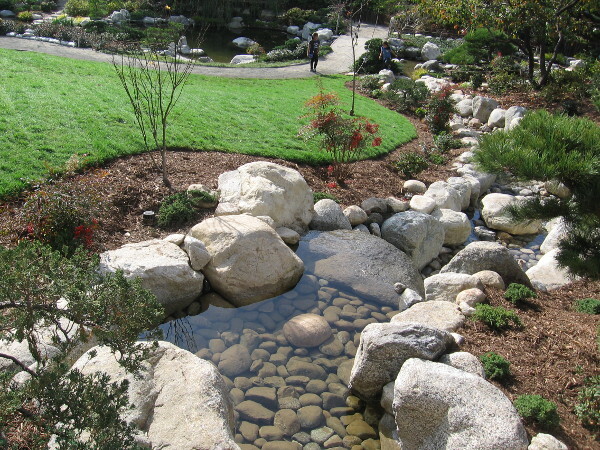 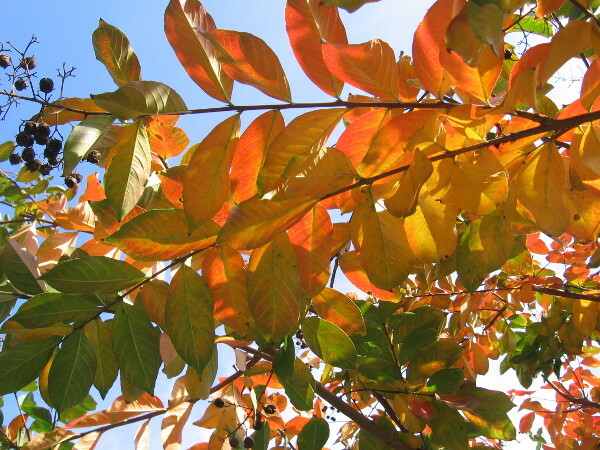 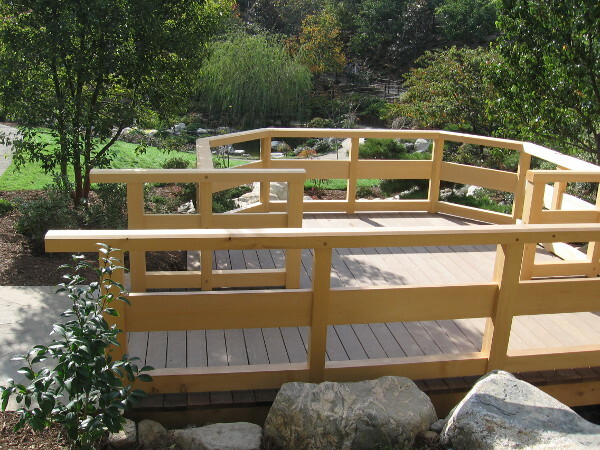 Walk up to the top of Presidio Park from Old Town and you’ll discover a variety of fascinating, historical sights. 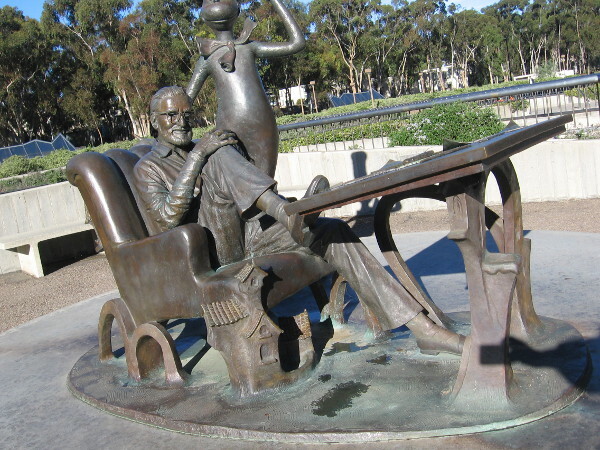 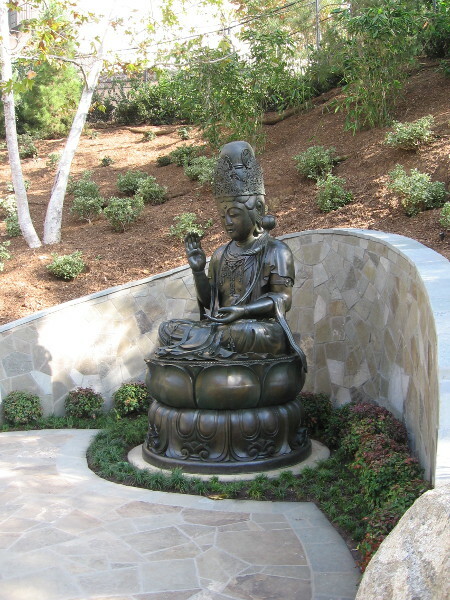 Possibly the most amazing, apart from the impressive Serra Museum building, are two extraordinary bronze sculptures, The Indian and The Padre, by renowned sculptor Arthur Putnam. 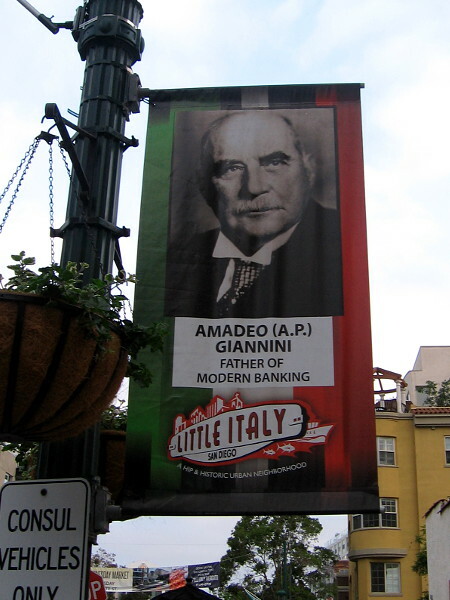 The Padre was cast in 1908. 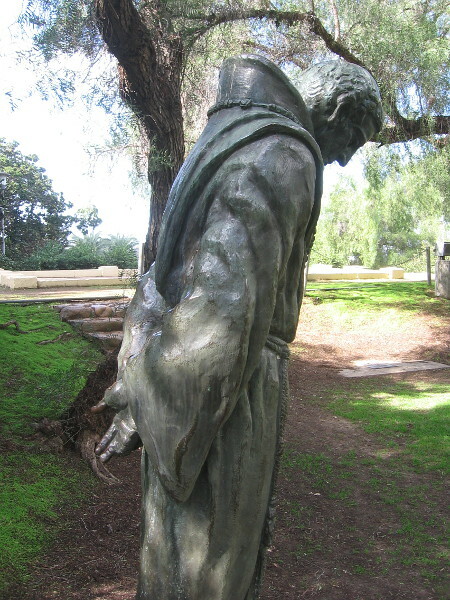 The figure of a Spanish friar stands in a small, quiet space among trees, not far from the spot where Junípero Serra founded Mission San Diego de Alcalá in 1769, which began as a temporary church at the Spanish presidio. 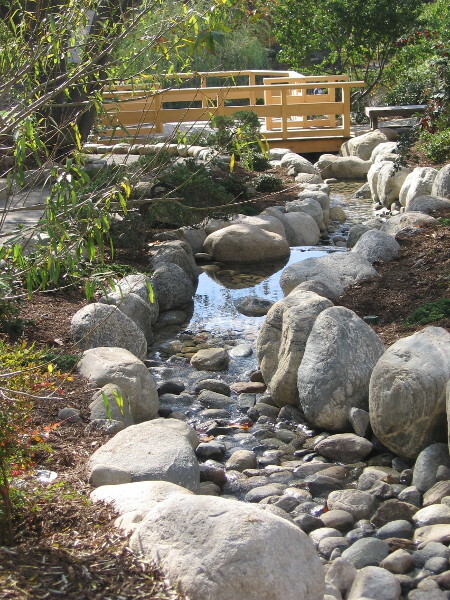 Five years later the mission would be moved a few miles east up the San Diego River to its present location. 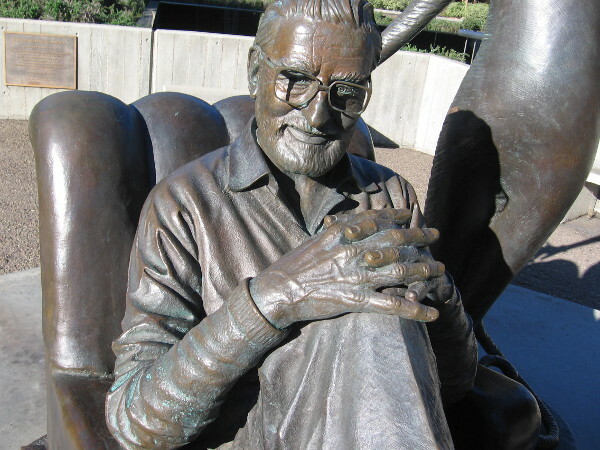 Here are photos of The Padre which show the sculpture’s quiet beauty. 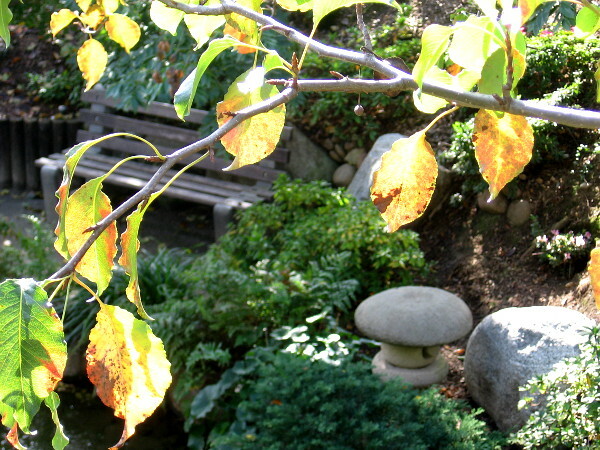 The Padre stands alone in a green, gentle place. 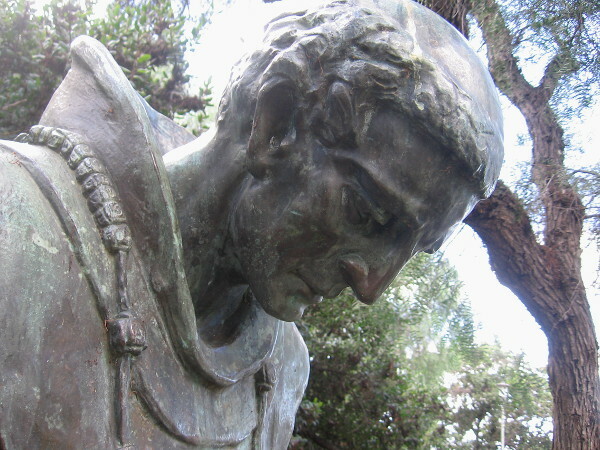 A Spanish friar seems to walk out of San Diego’s very early history. 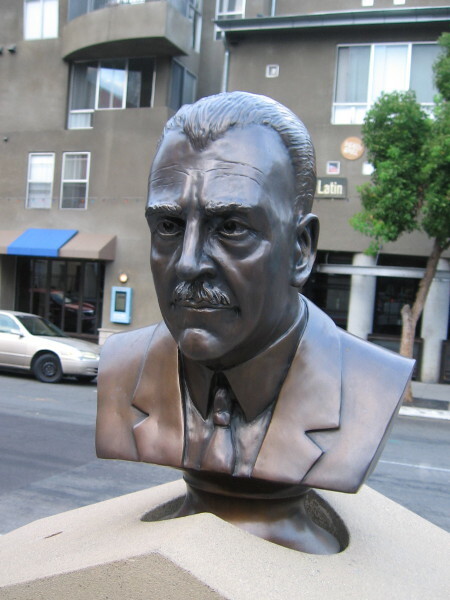 The Padre by Arthur Putnam. 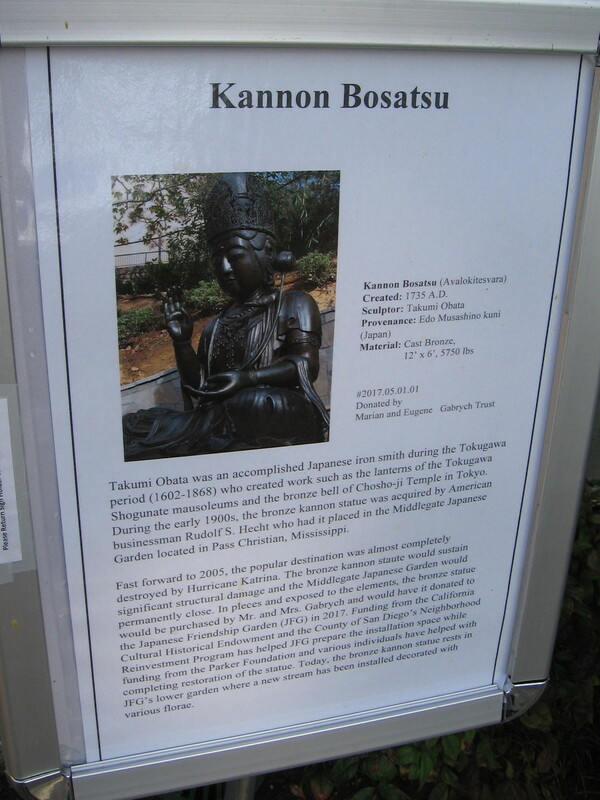 Given to San Diego Historical Society by the descendants of E.W. 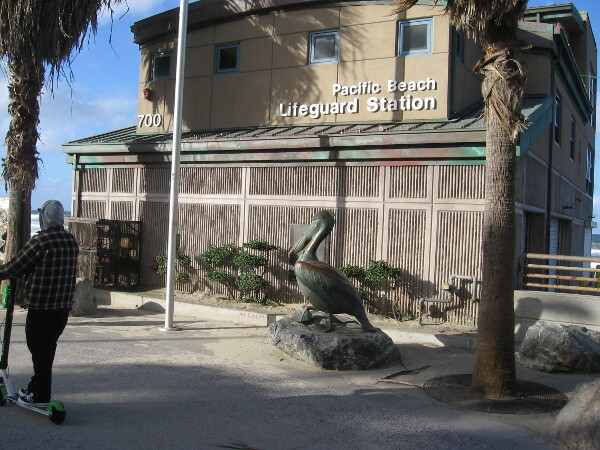 Scripps. 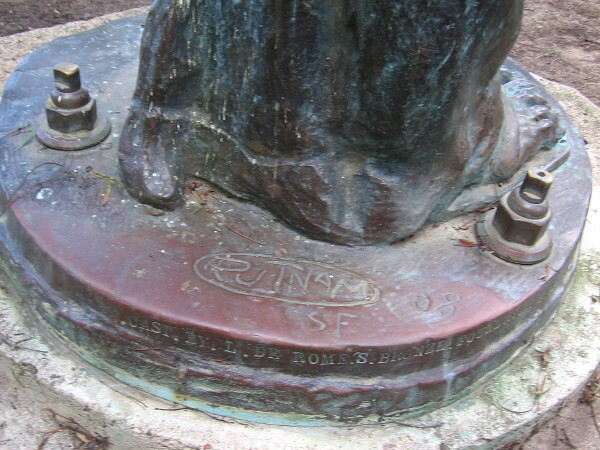 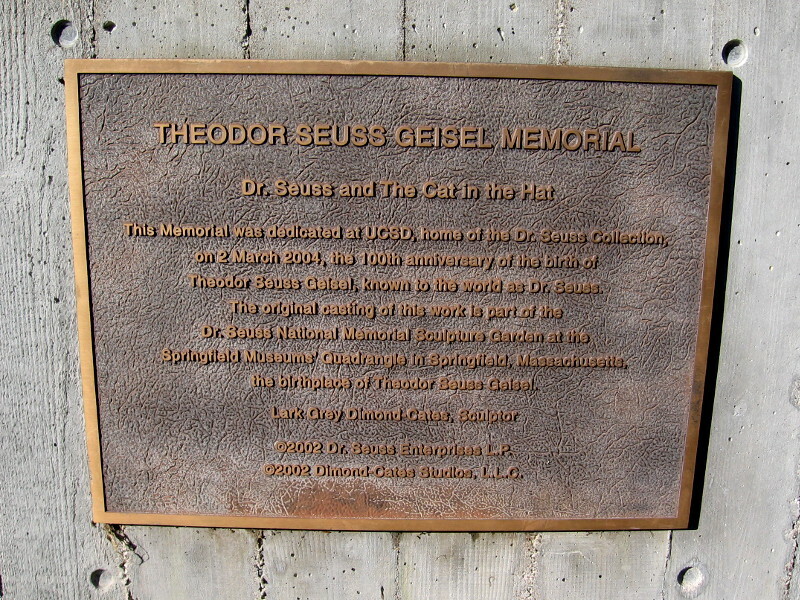 Markings at the sculpture’s base indicated it was cast by Louis de Rome’s bronze foundry in San Francisco, the city where Arthur Putnam lived for many years. 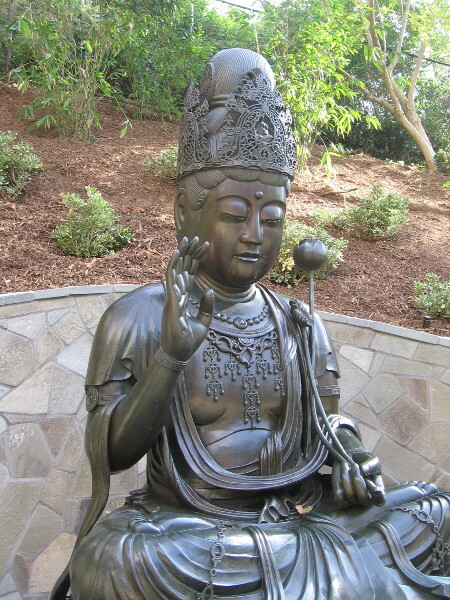 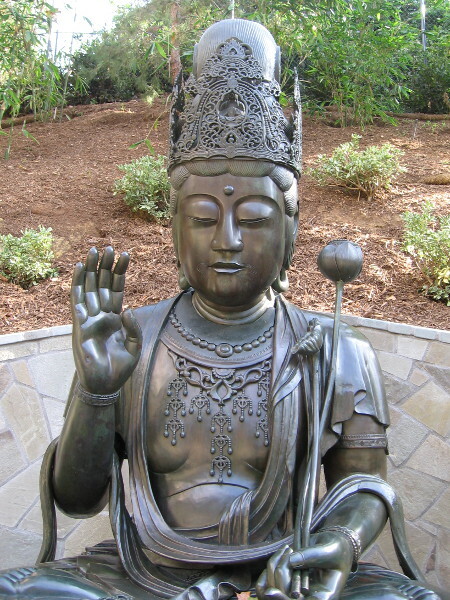 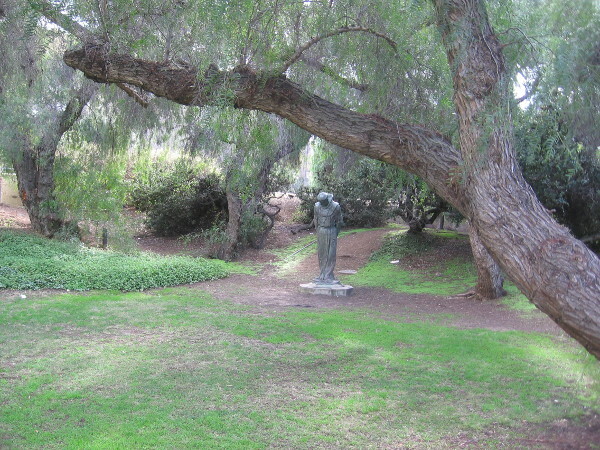 A quiet bronze statue among trees near San Diego’s now ruined and vanished Presidio. 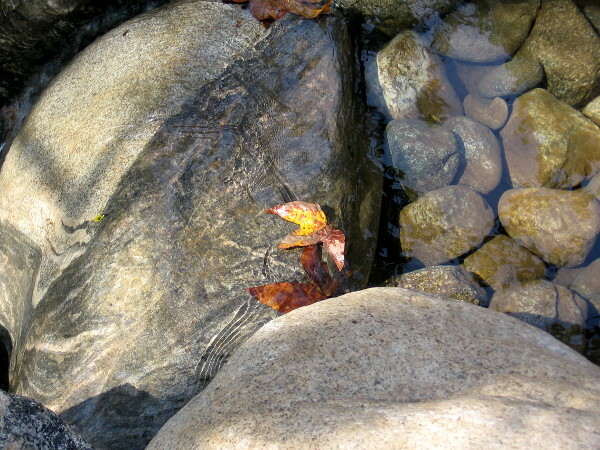 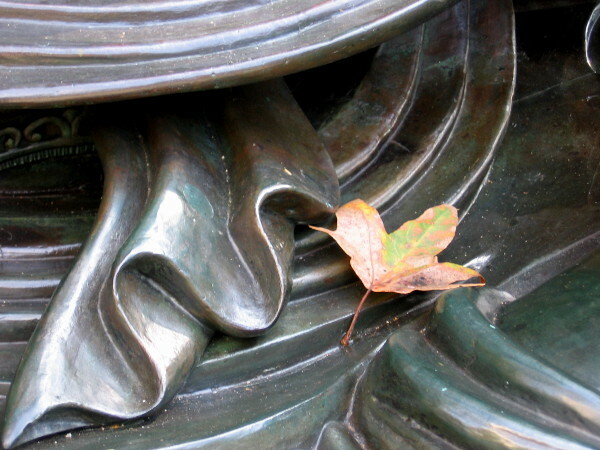 A spider’s web and small fallen leaves above folded hands. 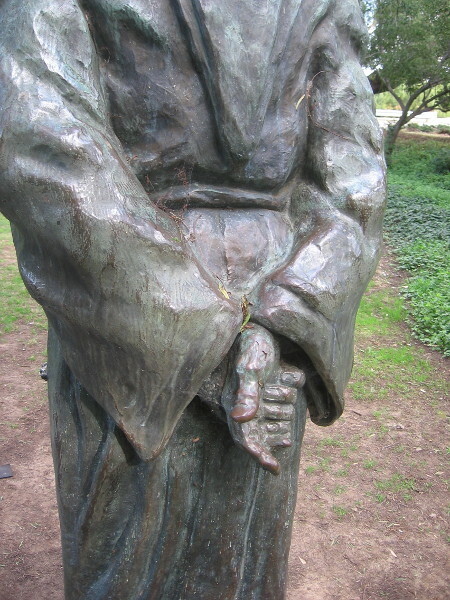 The Padre seems to be lost in prayer or silent contemplation. 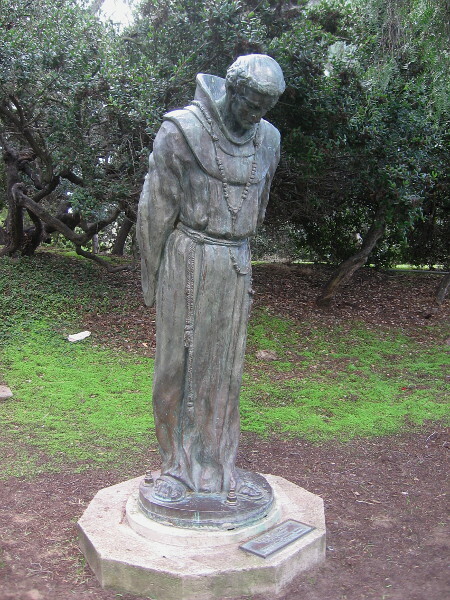 Close photo of bowed head of The Padre on Presidio Hill. 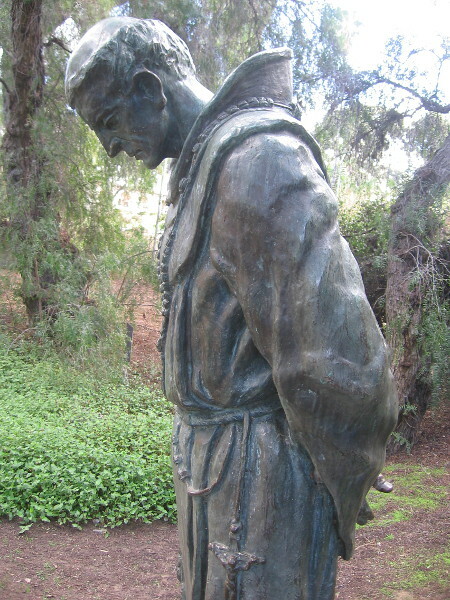 Posted on January 22, 2018 Tags art, artists, bronze, california missions, catholic, history, junipero serra, parks, photography, presidio, public art, san diego, sculpture, spain1 Comment on Photos of The Padre sculpture in Presidio Park.